Hydraulics is the workhorse of modern rigging and demolition, providing the muscles that lift, steer and drive the cranes, excavators, breakers, and hammers used each day. But hydraulics is not a recent innovation. In fact, examples of hydraulic power go back more than 2,000 years to ancient Rome, where it was used in water clocks, water wheels and pumping systems. In the 17th century, French mathematician Blaise Pascal made the groundbreaking discovery that serves as the basis for the science of hydraulics. Pascal’s principle states that when pressure is exerted at any point to a confined, incompressible fluid, there is an equal increase in pressure at every other point in the container. Thus, when one piston in a simple hydraulic system is pushed down, the other piston is pushed up. Applied to a more complex hydraulic system, Pascal’s principle allows forces to be multiplied. If a second piston has an area ten times that of the first, the force on the second piston is ten times greater, because the pressure is equally distributed on the larger piston’s entire surface area. The larger the surface of the second piston is in relation to the first, the greater the mechanical advantage. Hydraulics have been used in rigging and demolition since the mid-19th century, when cranes powered by water were used to load coal onto barges. Nowadays, oil is the fluid most commonly used in hydraulic equipment. 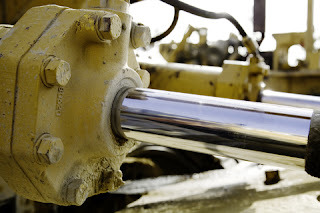 On any given day, hydraulic equipment is present throughout R. Baker rigging and demolition projects, powering crane booms, telescoping sections, and outriggers, excavator steering, booms and attachments, and on loaders, dump trucks, lulls, and hydrauic hammers. Wherever strength and force is required in our industry, hydraulics are overwhelmingly the power of choice. R. Baker & Son All Industrial Services, a Service-Disabled Veteran-Owned Small Business (SDVOSB) in business since 1935, is a premier specialized contractor operating in the United States, Canada and Puerto Rico, with over one hundred employees and an exemplary safety record (we have been directly involved in four sites that received VPP OSHA Safety Awards). R. Baker & Son is financially strong, with bonding capabilities over $10 million. Capabilities include industrial and commercial demolition, rigging, machinery- and plant-moving, dismantling, decommissioning, plant and equipment relocation, interior demolition, selective demolition, warehousing, wrecking and razing, millwright, plant reconfigurations, heavy rigging, salvage, environmental services, remediation, decontamination, abatement, and investment and asset recovery.